When I was small my mother always told us to finish our food because people were starving in China. To me it was always “poorChina”, one word. 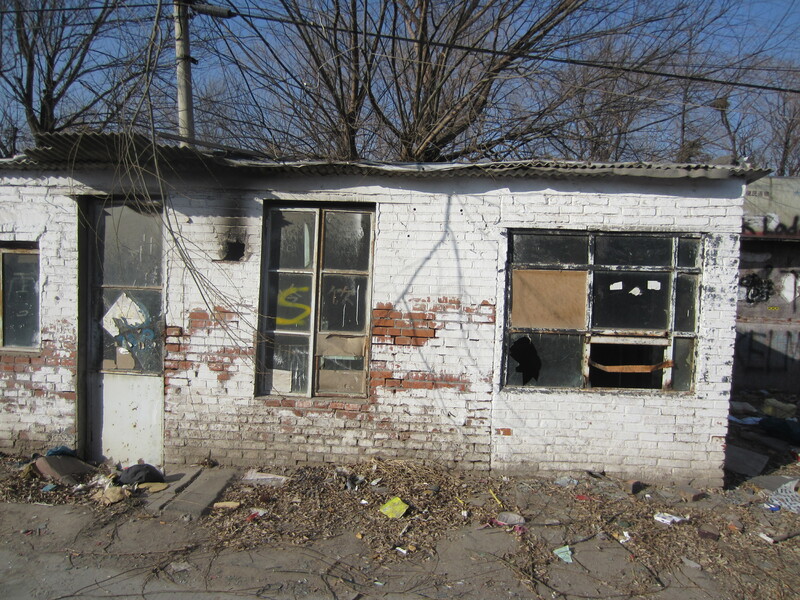 There are still a lot of poor people here, but there is also a phenomenal amount of wealth. The contrasts can be quite surprising, almost poetic… like when I saw an ancient bicycle leaning against a huge, sparkling new Bentley. But they can also be rather sad. Along one side of the boys school there has always been a small local village. Walking through it was an adventure and it seemed much more real Beijing than the gated communities we live in and the mega malls filled with H & M, Nike stores and big western style supermarkets. “Our” village was full of little shops selling everything you can possibly imagine, wonderful stalls overflowing with vegetables, a hairdresser where boys with pink hair would give you a wash and blow dry, a Jamaican bakery and a pub called Pomme O’Sheas. I’m not sure how many houses there were. I’d guess about 100, some with no glass in the windows, but a big satellite dish on the roof. When we arrived last year, we heard rumours that the village was slated for demolition and brand new villas would be going up in its place. However, this rumour had been floating around for a long time and most people were pretty skeptical. 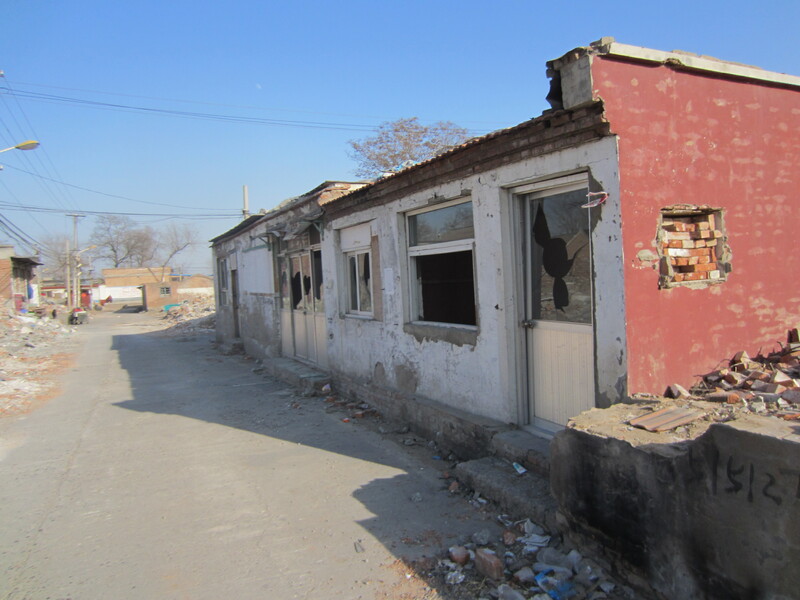 There are tons of villas being built all around us and many of the existing compounds are full of empty houses. Compounds are big employers… they have guards, gardeners, office people, street sweepers and sales people. All the houses have at least one Ayi (housekeeper) and almost all have a driver too. Most of these jobs are not high paying. These employees could never afford to live in the compounds. But they could afford to live in the village, and many villagers rented out rooms. 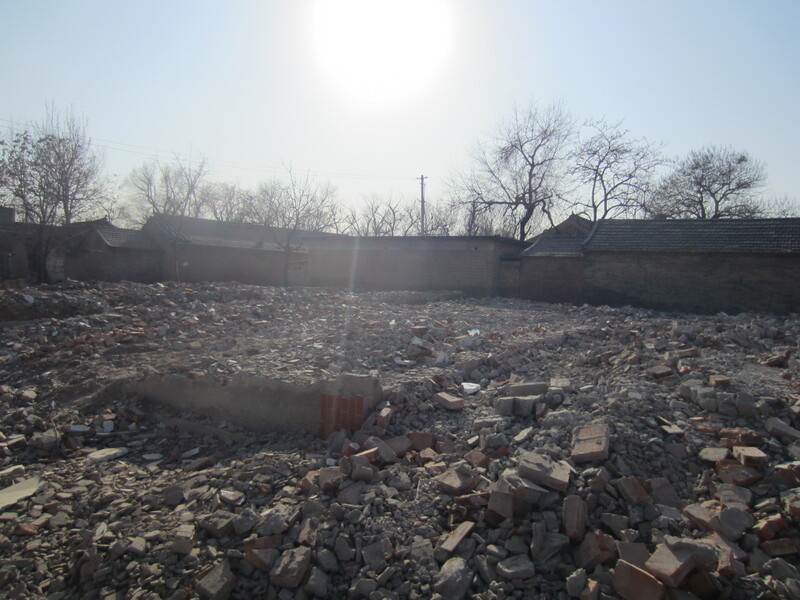 We were shocked when we returned from Christmas to discover the village was gone. The houses and shops were being demolished and huge billboards had gone up advertising the luxury villas that were on their way. 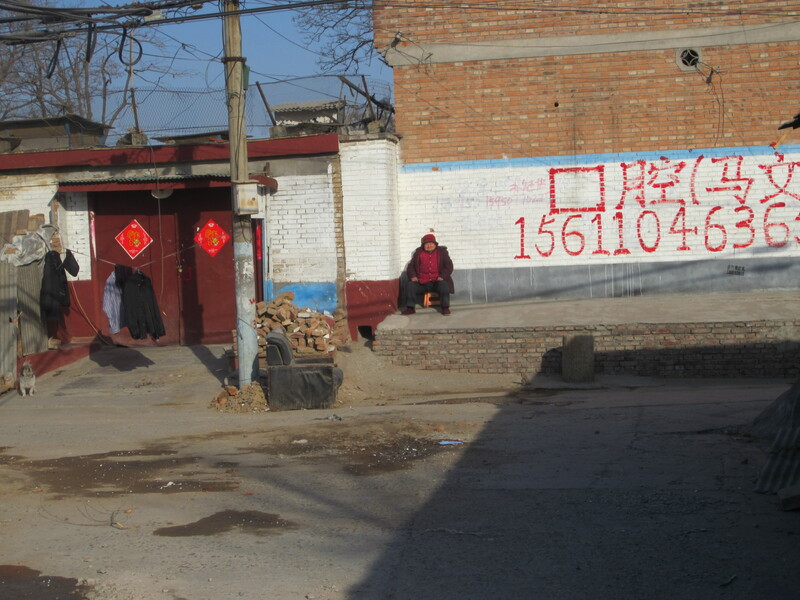 The villagers had been moved to high rises about a kilometre away. We’ve heard that some people are delighted… they now have heat and running water. 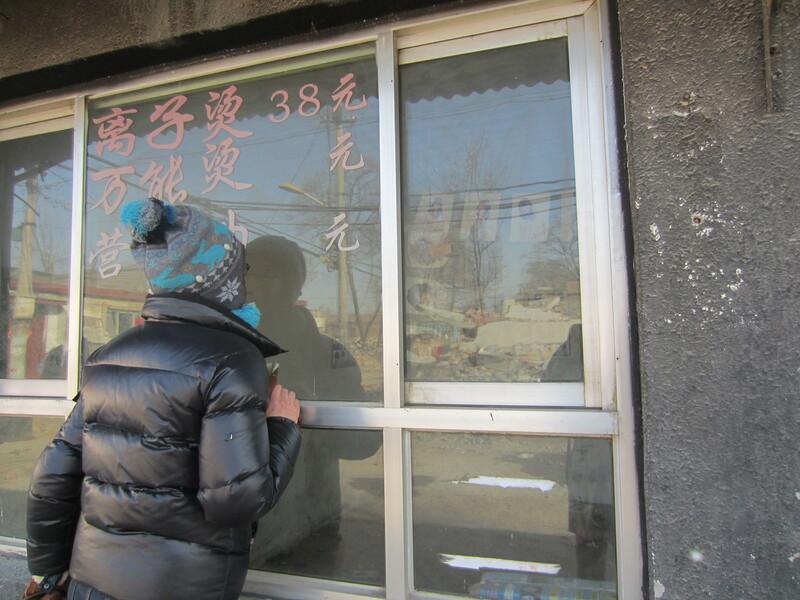 Others were dismayed… they no longer had rooms to rent and so suffered a cut in income. Businesses were lost and no compensation offered. And people who rented rooms unofficially (as many did) had nowhere to live and had to find accommodation far from their jobs. Last week Chowder and I and our friends Suzanne and Marley (Marley is Chowder’s friend, Suzanne is mine) walked over to see what was left. We had a hard time even figuring out which path of ruined buildings had once been the vibrant high street of the village. We saw a couple people wandering around and one shop that still looked open. A few houses had bits of laundry drying on the line. There was a truck being loaded up with bricks. The people loading did not seem very happy to see us and we decided not to take any photos of them. And there were a lot of stray dogs. It seems they are not allowed in the new apartments. The police will probably come along and kill them soon. Suzanne threw them the treats she had in her pocket. I, sadly, hadn’t brought any. It was depressing to see this once bustling village so desolate and falling down. As we walked home we decided to blag our way past the tight security into the poshest section of our compound. It shares a wall with the old village. Here the houses are huge and expensive (7 to 10 million dollar range) and equally empty as those in the village. 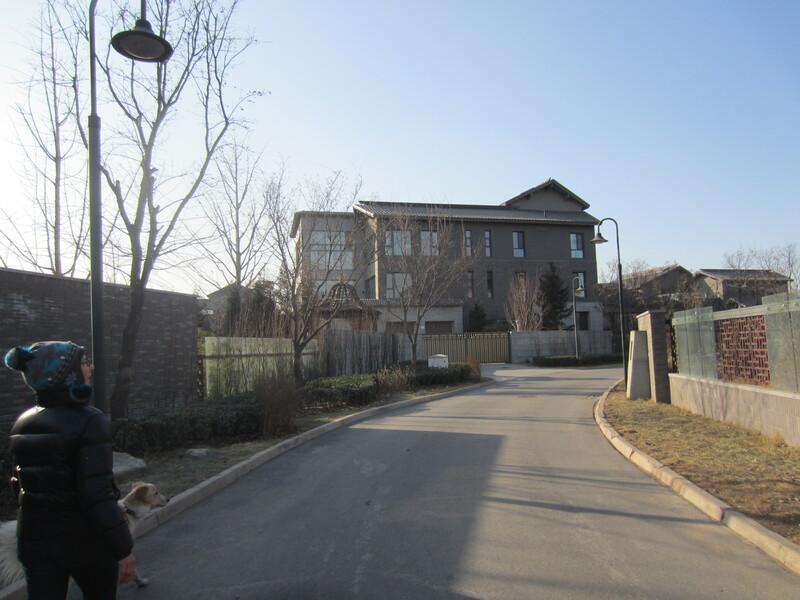 These houses are for the wealth Chinese and are said to be owned by film stars and government officials. Few expats can afford to live in this area; the days of huge housing allowances are long gone. Only a couple looked lived in. We said “ni hao” to the bored looking guards and only saw one other person walking around. It felt like a ghost town and in a strange way equally as depressing as the village. We were relieved to get back to our middle ground, filled with hustle and bustle, people coming and going and kid and dogs racing around.